Hatsumi Yoshiaki was born on December 2nd 1931 in the town of Noda in northern Japan. He later changed his name from Yoshiaki to Masaaki. His father started teaching him kendo when he was 7 years old, and he also started practicing judo and karate. In high school he was a gymnast and a boxer. He also took dancing classes which, as he believes, later helped him master movement in martial arts. During college he continued practicing judo and karate and he also enrolled in drama class. While studying medicine he also received 4th dan in judo. He was offered to teach judo to American soldiers in a military base, which he accepted. He was 20 at the time. Soon he notices that the Americans, who are much stronger and bigger than himself, learn much faster than the Japanese. He started doubting his training. What is the point of a martial art if a bigger and stronger person can easily defeat you? That’s when Hatsumi started searching for a real warrior craft. He started paying about 300 000 yen monthly to a Kobudo master. He completed this training in 3 years. 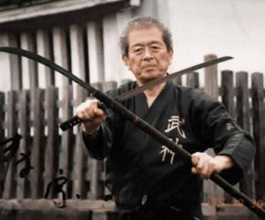 In 1957 at the age of 26 he met Toshitsugu Takamatsu (whose warrior name was Mongol Tiger) and lived in Kashiwabara. During the next 15 years every weekend he travelled through the island of Honshu to meet his teacher. It took 9 hours by train to get to his house. 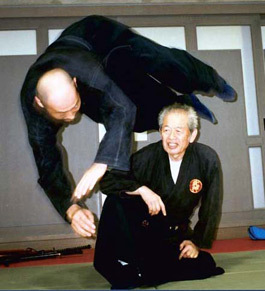 Hatsumi sensei has been a student of Takamatsu sensei for 15 years, after which Takamatsu sensei decided that Hatsumi sensei should be the next Soke (heir) of 9 schools: Togakure Ryu, Kumogakure Ryu, Gyokushin Ryu, Gyokko Ryu, Kotto Ryu, Takagi Yoshin Ryu, Shinden Fudo Ryu, Kukishinden Ryu and Gikan Ryu. 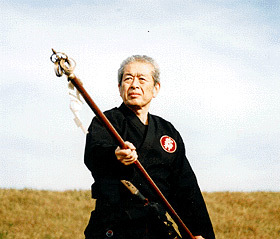 Hatsumi sensei has held a number of seminars and lectures around the world and has also received many acknowledgements. 2001 – he became the first Budoka who has received the Pope’s blessing from the Vatican for the kindness that soke Hatsumi has brought to the world through his teachings and travels.